Every year local cyclists shake their heads at cowardly Tour de France organizers that run the Tour right by this Jura giant, but refuse to climb it. It's just too steep! Every year local cyclists shake their heads at cowardly Tour de France organizers that run the Tour right by this Jura giant, but refuse to climb it. It’s just too steep! Don’t confuse Le Grand Colombier with the more famous Tour de France Alp climb Col de la Colombiere – about 50 kilometres away (Colombe means Dove in French). Click the link for details of the 2009 Tour de France climb via the little known Col de Romme. PS – Le Grand Colombier is less well known, but it’s definitely harder. There are four great – very challenging – routes up this massif. I have previously climbed Colombier from Culoz. It was cool and grey today but I was determined to climb this from the hardest side starting in Artemare. 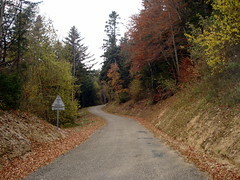 Almost from the start, it is a typical, beautiful deserted Jura road heading up through a forest. It’s good enough quality for a road bike but I brought my hybrid for the easier gearing. Cyclists can be like fishermen, exaggerating the difficulty of a climb. 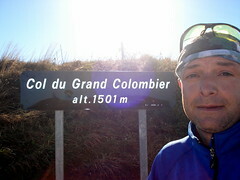 But Le Grand Colombier is something special. One kilometre averages 15% and another full kilometre averages 13%. For perspective the steepest average single kilometre on Alpe d’Huez is 11% and on Galibier 9%. I had no speed or time goals, I just wanted to finish. As I approached the steepest stretches (one bit is 22%) I could have walked as fast as I was riding, but I was determined to pedal the whole route. My God!! But too much fun. Nearing the top, I deserved some luck for the effort, and suddenly I burst through the clouds into bright sunshine (OK, burst makes it sound like I was going faster than I was). 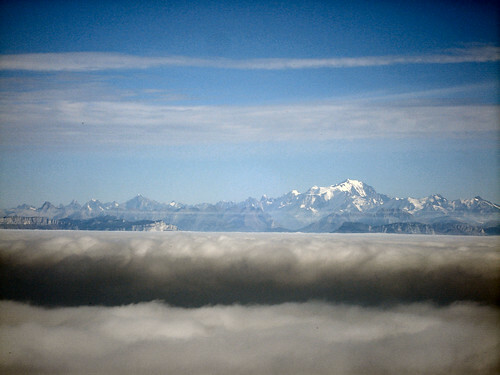 Mont Blanc was right there in my face above the clouds. Beautiful. I was absolutely soaked with sweat from the effort so the descent was shockingly cold – I took the super-scenic easier (but still very difficult) way back to Artemare, as even top cyclists won’t usually descend the route I climbed – it is just too dangerous. Cyclo tourists will continue to flock to places like Alpe d’Huez, Galibier, and Ventoux – and for good reason. But this area — with Mont du Chat just down the road (Le Cycle magazine’s July issue called it the toughest climb in France) and Col de la Biche on the other side — is filled with challenging, stunning rides on virtually deserted roads. Le Grand Colombiere is part of the Jura mountains (as in Jurassic) not the Alps. Following the Rhone as it leaves Lake Geneva, a good rule of thumb is any mountain on the North/West side of the river is a Jura, and anything on the South/East side is an Alp. From June 2006: Probably the most famous climb in the Juras. There are four very steep ways up this monster. To become a Confrérie des Fêlés du Grand Colombier (translated: Brotherhood of Loons (freaks, crackpots) of Grand Colombier) one needs to climb all four in one day. YIKES …. I am a decade past being able to do that as each climb is a challenge in its own right. One route has parts with a grade of 22%! Trust me 11% is very hard, 22% near impossible. Cyclists are sternly told not to descend by this route. It’s just too steep. Although just climbing 2 sides grants member status. Enjoy browsing your photos, and i’m damn jealous !! I’m stuck here in Stoke on Trent !! —- but close to the Peak District and other U.K. delights ! Great website you’ve got , appreciate all your work . I too enjoy col climbing and have been at it since i was a teenager in the lat 1950’s !! I’m in the u.k col climbing club otherwise known as the OCD- Order Col Durs ( the order of the hard cols … or should it be -Obsessive Compulsion Disorder !! I think the latter certainly fits !! Nice to see the skiing pics of La Plagne,Wengen and Les Arcs , weve had some great ski hols there .. and we are off to Belle Plagne again next Jan.
Good luck with your alps challenge and …allez, allez!!!! Hi Dave – Thanks for your note. I am quite familiar with your exceptional photos at FLICKR (I have great landscapes but no photgraphy skill). FYI – probably the craziest thing I have ever done on a bike was trying to combine my love of skiing and cycling. This past January I mountain-biked up to Les Arcs 1950 while my wife drove – there was ice at the BOTTOM of this 25 km climb. Luckily I didn’t have to descend it. Yes I can’t wait for Bonnette/Restefond to be in the Tour. I have only cycled the North side (the tour is coming from South I think). Haven’t done the Pyrennées yet. A dream though. Enjoy Belle La Plagne (cycled it this August – and struggled). We will be skiing at Les Arcs which is of course linked with La Plagne. You are a cycling god. I’m truly impressed. Congratulations for this climb, so beautiful and hard ! Yes, I am sure you are correct that it is a question of money. C”est Dommage. I climbed Col de la Biche and Col de Richemont in April. What a beautiful car-free (sans voitures) route. But to also do Grand Colombier the same day? Well, i know you are much younger than me. 🙂 But that would be a fantastic end for a Tour de France stage. The route in comment 7 above is the easiest. You can start in Artemare – go THROUGH virieu le petit and turn up near lochieu.